The episode indicates how social change is really made. It has to begin on the abstract levels of “reverie” or dream. A student of Jewish tradition, a scholar in the Hebrew language, Reuchlin was a pioneer of universal brotherhood. Not all Reformation movement was Lutheran, of course. Unlike Martin Luther, the Amish and Hutterites do not adopt a top-down structure for their Churches, have no professional priests and do not believe in State-sponsored churches. They do not adhere to the cult of machines and reject the worship of technology, which, by the way, was central to Nazism – a fact that should not be forgotten in the present “technological civilization”. The Amish and the Hutterites refuse to participate in military conflicts of any kind. They try to live instead in the unbureaucratic spirit of the original Christian teachings. Source of date, “Collected Writings”, H. P. Blavatsky, volume XIV, and Encyclopaedia Britannica. Reuchlin is also known as “Johann”. “Collected Writings”, H. P. Blavatsky, TPH, USA, volume XIV, p. 169. See her article “The Trial of the Sun Initiate” in “Collected Writings”, H. P. Blavatsky, TPH, USA, volume XIV, p. 266. NOTE BY HPB: Vide the title-page on the English translation of Mayerhoff’s “Reuchlin und Seine Zeit”, Berlin, 1830. “The Life and Times of John Reuchlin, or Capnion, the Father of the German Reformation”, by F. Barham, London, 1843. “Isis Unveiled” Volume II, by Helena P. Blavatsky, p. 20. Regarding the Anabaptists, click to see the article “The Practical Philosophy of the Amish”. An initial version of the above article, with no indication as to the name of the author, is part of the February 2018 edition of “The Aquarian Theosophist”, pages 15-16. 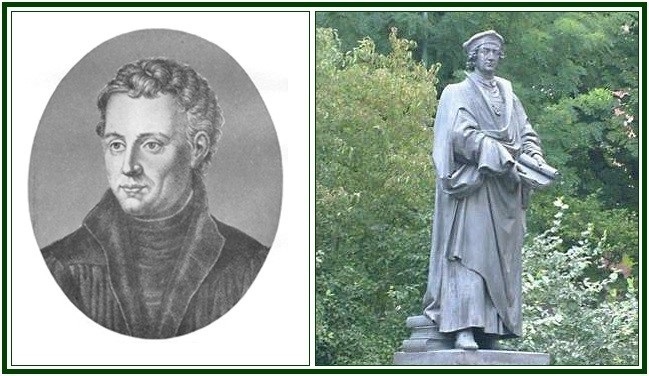 “Reuchlin, the Father of Reformation” was published as an independent text in our associated websites on 22 February 2019.